Is your social media content silently hurting your brand? 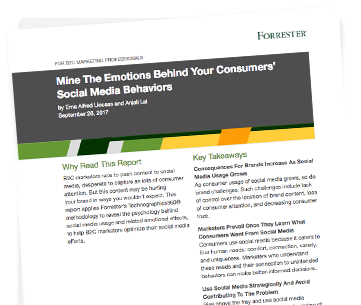 In this report by Forrester, explore the psychology behind why consumers use social media and what they expect from brands on social media. You’ll discover how to deploy social media strategically by removing/avoiding content that inadvertently drives negative consumer behaviors. Download the report to understand the psychology behind consumer responses to social media and how to create a positive strategy that boosts your brand.